Comic Fest 2016, held at the Town and Country Resort in San Diego, was a blast! A smaller, more intimate version of Comic Con, the festival had a great line-up of presentations, workshops, signings and exhibits. Featured speakers, Joe and Joan Clokey, gave a fascinating presentation, “Gumby through the Years,” in which they described how Gumby was created, and they highlighted key events through Gumby’s rich 60-year history. The audience was treated to some rarely seen behind-the-scenes footage, the long lost Gumby pilot that first aired on NBC in 1956, and personal anecdotes about the creator Art Clokey. The Clokeys hinted at new productions in the works. Artists, writers, publishers and even costumed characters were on hand to discuss their work and passions during the three-day festival. Fans had the opportunity to get to know the people behind the creative works. Attendees learned about: the past, present and future of comics; how the industry has changed over time; and the rising importance of digital comics and graphic novels. Students and aspiring artists got some insider tips on creating, publishing and selling comics. 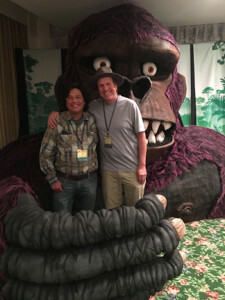 Mike Towry, a comics dealer in San Diego, was part of the small group of fans who founded a festival in 1969, which became known as the Sn Diego Comic Con. Mike and other Comic Con veterans started the first Comic Fest in 2012, following the 40th anniversary of the original Comic Con. 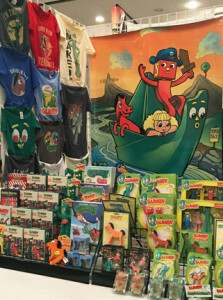 The founders sought to re-create the vibe of the very first Comic Con, which was focused on the writing and art of comics. Comic Fest 2 016 provided inspiration and entertainment for all whom attended. Learn more about Comic Fest.